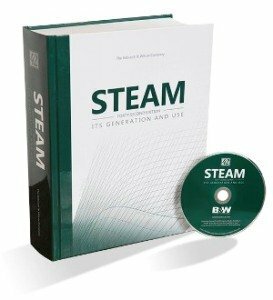 STEAM remains the longest continuously published engineering text of its kind in the world. This edition marks the 140th anniversary of the first edition which was published in 1875, not long after an engineer named Stephen Wilcox, Jr., applied his knowledge of water circulation theory to perfecting a new and safe boiler concept. Today, B&W is an internationally acknowledged leader and authority in all aspects of steam generation, from fundamentals and research, to engineering and manufacturing, service and construction, and protecting the environment. We continue to share our expertise through the publication of STEAM. An electronic version of STEAM 42 is included on a CD in every copy.